Notes: An absolute joy of a find! 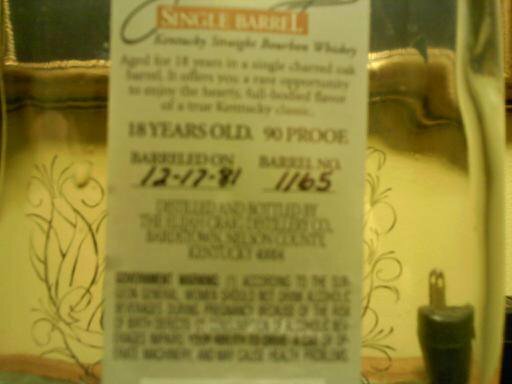 This particular bottle was barreled on December 17, 1981 (Barrel No. 1165), so it had been around since about 1999. I credit my father for leaving this bottle unattended for me to stumble across. Aged for 18 years in single charred oak barrel hand chosen by the master distillers, this bourbon has the elegance of a high end bourbon for the exceptional price of around $40-$50 depending on location. Elijah Craig 18 Year is among a small collection of bourbons that is allowed to age to this maturity and it reflects in it’s taste, color, and richness. A multiple award winner, this bourbon took home the Gold Medal at the 2004 San Francisco World Spirits Competition. This bourbon is best drank neat and would be a great compliment to the cigar smoker. Color: Cloudy, deep amber, a slight orange tinge. Nose: Sweet, a mix of nut and caramel. Taste: Smokey caramel is what I noticed first on my tongue, when I drew in a breath I tasted a hint of vanilla. The smoke flavor is very intense from the charred barrel and it is warm all the way down. The oak and vanilla aftertaste linger on your pallate allowing you to enjoy this sipping bourbon long after your last drink. Definitely recommend for Scotch lovers. Finish: Bold! Lingering, tingles slightly but smooths out very nice. Bourbon reviewed by Adam Boyd, BourbonBlog.com’s D.C. Metro area Bourbon Correspondent. Everything you wrote is so true.I really dig your very first post as well,real good stuff.